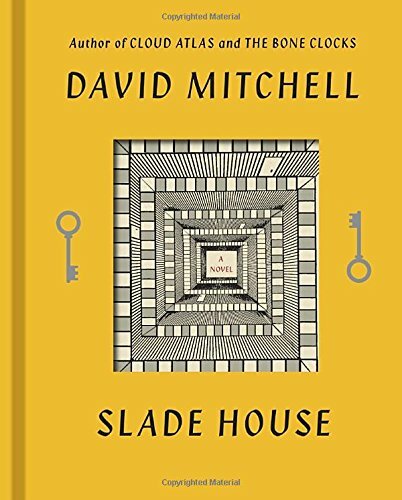 Slade House by David Mitchell, was a unique book unlike any other I have ever read, to say the very least. The mystery of this house is what drives this story, and makes you not want to put the book down. It starts off eerie, and with each story, your hunger grows to find out what truly happens in this house and why. There are five stories/disappearances that happen in the Slade House, and with each story the reader starts to understand a little bit more and more about the contraption of the house and what happens inside. The first starts off with a boy reluctantly with his mother on their way to a house that they were invited to. It is told from Nathan, the boy’s point of view, and at the house he meets the son of Lady Grayer, the woman who owns the house. Nathan and Jonah run around and play games at the house. During the visit Nathan think’s he is hallucinating and he ends up waking up thinking it was all just a dream. However, he is not actually dreaming that was reality and when he thinks he is awake it was really just a dream. He then is ‘woken’ up and his soul is eaten by Jonah, the boy he was playing with. This point in the story is when the reader starts to realize the book may not be consistent with reality. In the next part, we are then thrown into the life of a detective, Gordon Edmonds. He is investigating the disappearance of Nathan and his mother and stumbles into the Slade House. After some investigating, his soul is then consumed by a woman named Chloe who was actually Lady Grayer, the house master in disguise. After this second story, the readers start to recognize a pattern that is steady throughout the rest of the book. The process of entering and investigating the house continues for three more stories and with each additional story, a new piece to the puzzle is added to solve the mystery of the house. The readers found out the history of the house owners and why they consume souls. The final story is the wildest and more important, that pieces the whole story together. In the final story of Slade House, Lady Grayer is back to luring people into the house by herself. In the fourth story, the character got away before the soul was consumed, and the ‘house’ feeds off of the energy of these souls, and thus it is growing weak. In her tactics to try to get people to come to the house, she invites a psychologist to the house who knew Fred Pink. Again, the psychologist is drawn to the attic however, she is not who she says to be either but she is immortal and cannot be consumed. They try to attack her soul but they are too weak, and she destroys them and the house collapses, and just as this is happening Lady Grayer puts her soul in a child that is still in the womb, somewhere far away. After writing this summary of the book, I realized how crazy everything actually sounds. It was a little hard to follow at times , but the one thing that held this story together were the connections between each story. Whether it was a friend of a friend in the next story, each past story was connected with the story being told. The other connection that ran through the story was the nine year difference between each story, and by the time the story ended 36 years had passed. Lastly, I think the small connection of the pub at the beginning of each story symbolized the start of the dreamy like state people get when they enter the Slade House. One of the main strengths of the author was the cleverness and consistency of each story. Each story gave the same eerie feel, with whole new characters and backgrounds. Yet at the same time, all of the stories started off and ended the same way. Everyone passes the “Fox and Hound Pub” in the beginning on their way to the house, and then they all run into the Slade House by accident and then all somehow ‘stumble’ into the attic to have their souls eaten. This ability to flow from five stories so smoothly was incredible. After the second transition of stories, I started to realize what was going on. This is the main weakness of the author. A lot of things had to be implied, for example after reading the first story of Nathan I had no idea his soul had been consumed and he was dead. I only then realized this after the second story and as it transitioned into the third. However, this does add the element of mystery to it, so I can understand why it was a little unclear. Overall, this book is well written, the plot about the house was original and the development of characters in such little stories was excellent. There were many characters throughout the book but each story revealed a lot about the characters and their motives in such a little space. For example, in such a short period of time the readers were able to learn about Nathan and his parent’s divorce and how he may be addicted to pain medications. The revealing of small important snippets about the different characters makes it believable that these people are actually humans inside of a dark paranormal world. With that note, it is a silly story, as none of these things can actually happen and you are taken deep into the world of “Anchorites,” souls being consumed, and the very fine line between dreaming and reality. But if you can suspend disbelief, it does make a great ghost story. I would recommend this book to people who love mystery and ghost stories because this is a perfect combination of both. About the Author: David Mitchell is the award-winning and bestselling author of The Thousand Autumns of Jacob de Zoet, Black Swan Green, Cloud Atlas, Number9Dream, Ghostwritten and The Bone Clocks. Twice shortlisted for the Man Booker Prize, Mitchell was named one of the 100 most influential people in the world by TIME magazine in 2007. With KA Yoshida, Mitchell co-translated from the Japanese the international bestselling memoir, The Reason I Jump. He lives in Ireland with his wife and two children.